The hippest Akronites know that the third Thursday of each month is a perfect time to explore arts, culture, cuisine, and entertainment downtown. I, for one, love a free trolley ride that stops at over 30 exciting destinations in the city! But why limit yourself to enjoying downtown Akron one night out of the month? If your concern is breaking the bank, fear not! Last Thursday (the second Thursday of the month), I was able to explore a spectacular exhibition at the Akron Art Museum, hang with the city’s coolest cats at Blu Jazz’s monthly jam session, and even enjoy a delicious dinner at Bricco on the corner of Exchange and Main with my mom, sister, and our friend Matt. I only spent $13, and that was for my meal and the tip! The gorgeous and engaging multimedia creations of Nick Cave and the sultry sounds of Theron Brown were absolutely free. Every Thursday, the Akron Art Museum offers free admission to everyone from open to close. It’s always an incredible opportunity, but experiencing Nick Cave’s work free of charge was truly a gift. His elaborate soundsuits (named for the noise they make when they move) are stunning. Vibrant and eclectic, these human shaped sculptures command the viewer’s attention and introspection. There are 10 soundsuits, each standing on a runway-like platform, composed of found objects like buttons, sock monkeys, globes, beads, metal flowers, you name it. Cave began working on the soundsuits over two decades ago in response to the beating of black motorist Rodney King in Los Angeles. Cave says the soundsuits, which are mounted on black mannequins, are crafted to be imaginative types of armor that protect from profiling on the basis of race, gender, and class. The suit I found most striking was situated towards the center of the runway. It was made of shiny, silver buttons, but in the place of a head was a wide, gramophone shaped structure made of bristly wires. The storm-like pattern of the bluish, silvery wires was modeled after brain scans of several black youths who have been traumatized by gun violence and police brutality. 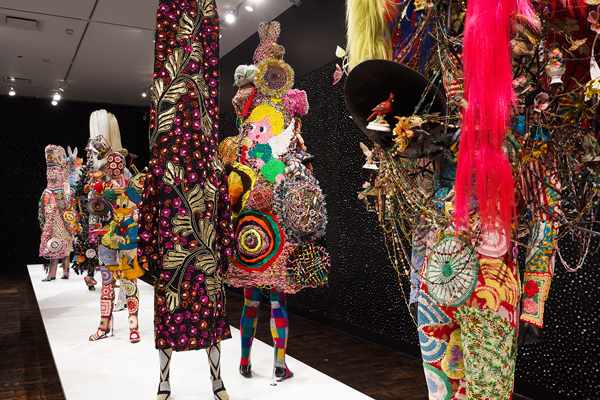 Nick Cave’s creations are mesmerizing and beautiful as they are disturbing and tragic. After the art museum, I would have been happy to call it a night. But when in Rome, (if you choose to think of Akron as Rome on any regular old Thursday, like I do) you do as the Romans do! And the Romans (Akronites) jam to Theron Brown at Blu Jazz. 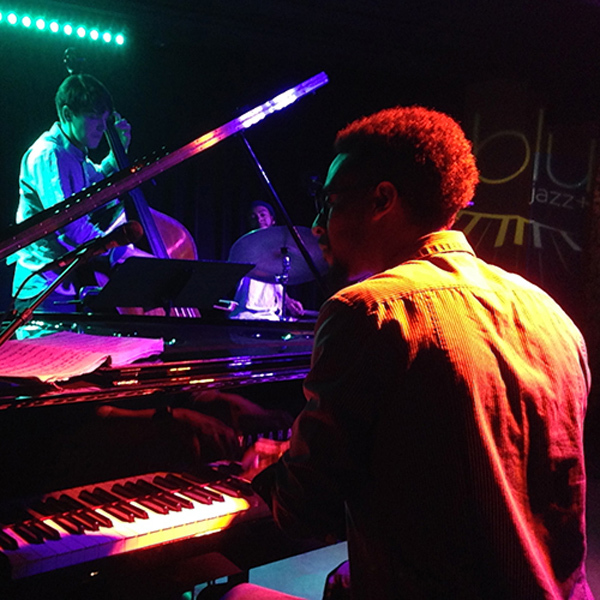 The acclaimed pianist and his trio of upright bass and drums were captivating as ever. Shannon (my sister), Matt and I managed to snag seats right at the edge of the stage. So close up, I could feel the trio’s exhilarating chords in my ears and their rhythmic beats in my chest. For their more euphonious tunes, I felt mellow and content sitting in the hazy, purplish dark of the club. We also had the pleasure of listening to the up-and-comers in the city’s jazz scene. Long time lovers of music and students just starting to dabble had a chance to play with Theron and his trio. The performers in the jam session were all quite good; had I not been told, I would’ve thought they were professionals too! After a few more songs, we decided to wrap up our evening. My friends and I headed home, grateful for an affordable night of artistry and excitement in beautiful downtown Akron.